The first known Fears made his appeal for earthly existence in the 1630's and died in 1707 in York County, Virginia. 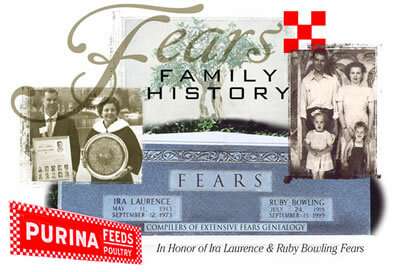 Since then more than 9000 Fears and Bowling relatives have been identified through the relentless research of Ira Laurence and Ruby Bowling Fears in whose honor this website has been established. To access this site, please contact us using the information provided below. SEARCH YOUR FAMILY HISTORY BY ANCESTRAL LINES ---- CHOOSE A BLOCK BELOW.